As an essential, everyday use kinda space, bathrooms can be tough when it comes to renovations. Especially when you're in a home where there is only one bathroom for showering. In addition to finding alternative showering locations, complete bathroom renovations can be messy, dusty, expensive, and long. This bathroom in particular had been partially updated by the previous owners with new floor tile, vanity, toilet and fixtures. Unfortunately, the original wall tile had been painted with some sort of tile paint that may have covered up the original peach color but has proven to be less than durable in the shower area. But despite these misgivings, it's not currently an option to do a complete tearout of the space. Instead, we focused on increasing the functionality of the space and giving it a bit more character with some new fixtures and finishes to spice up the builder-basic renovation that was previously completed. Below was the state of the bathroom when the home was purchased, while clean and maintained looking it was Boring with a capital B. The first steps were to install a ventilation fan, because we knew that we were going to be installing wallpaper and also, it's just a darn good thing to do, because despite having a window, you really don't want to be opening that during a shower when your neighbors windows are directly across from yours (!). The next step was to make space for a new medicine cabinet that we picked up at Restoration Hardware Outlet for a great price. The traditional style of the cabinet is probably close to what would have originally been installed in this space. Upon opening up the wall we could tell that there had previously been a medicine cabinet in the space, something bit smaller, but the remnants of the spot were there. We also found a signature on the wall stud with the year dated 1925, the year the home was built-so cool! We had the electricians swing by and install an outlet in the medicine cabinet. I encourage all of my clients to do this (and we've done it in several of our own homes), it's a great place to plug in toothbrushes and other personal care necessities that you may not want out in the open. The electricians made the line a little longer since we hadn't yet done the wallpapering, that way we could remove the cabinet for the wallpapering rather than try and cut the paper perfectly around it. We also wired up the new light fixtures and primed the walls in preparation for the wallpaper. The next step was installing this gorgeous wallpaper from local Philadelphia artist Carla Weeks. 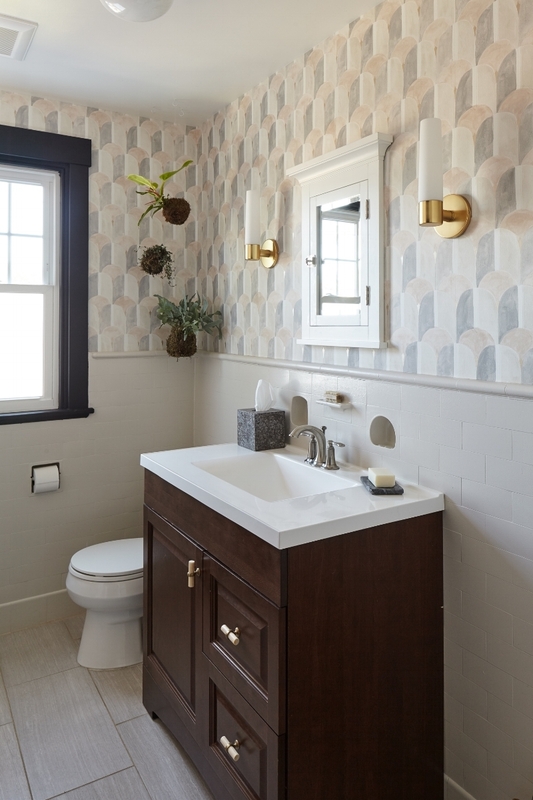 It added the character we needed for this monochromatic space and was especially affordable since we needed to only paper above the tiled wainscoting. And now for the reveal...we added a couple kokedamas for plant life and swapped out the handles on the vanity for some more interesting and substantial pulls. Kokedama's add life to the space, I like to think of them as suspended art, and they just require a once a week soak in the sink. I added in a curved rod to make the shower area feel more spacious and the shower curtain is a subtle grey stripe fabric, because stripes pair so nicely with just about every other pattern. A vintage wonky legged stool holds some spare towels, a glass of wine during the bath, or magazines on the daily.